If purchased by the case, most people want to keep their wines stored in their original cases. Unpacking and storing identical bottles on regular racks can be a waste of precious bottle space. Therefore, if you plan to purchase wine by the case, it’s important that your wine cellar be able to accommodate wine cases. Because wine cases vary in size, shelving units that are adjustable, like those with movable brackets, are a necessity. Although the average wine case is 8 ”x 14”x 22” some cases are larger, and wine cellar designers have observed a trend that wine packaging is becoming more creative, and that wines are being put into unusual bottles that are visually striking with greater frequency. This means the frequent appearance of “average sized” wine cases could be diminishing, making the need for adjustable shelving all the more apparent. Cellars can be constructed with drawer slides on lower shelves for cases that get moved around frequently and upper shelves that are adjustable to accommodate different sized cases. It’s important, if you’re designing a custom wine cellar, to let your cellar design team know if you plan on storing cases of wine. If so, there’s no need for good cases to be piled on the floor when an elegant, easy-to-adjust shelving solution would look so much nicer! Vintage Cellars can design a custom solution that will hold your cases (or large bottles, or split bottles, or whatever you have) beautifully and efficiently. Or, if you’re looking for a ready-made racking system, you may want to select one like this case and bottle rack that can hold a mix of bottle sizes and cases. While having your own wine cellar is ideal for storing and managing large wine collections, there may be times when it’s preferable to have select bottles close at hand. Say, for instance, you use a lot of wine in the kitchen and want some of your wine stored in an easy-to-access location. Or, perhaps you want to have some nice bottles on display for when guests arrive. Perhaps you’d simply like a small selection of wine at your disposal when coming home from a long day at work. For situations like these, perusing a vast wine cellar can often lead to indecision that can even delay the serving of a meal. This is where smaller wine racks suitable for use in the kitchen, or in entertaining areas, come in handy. Whenever you store wine, it is important that it be kept on its side; the cork, kept moist by contact with the wine, keeps the wine fresh. Small, portable wine racks are designed to do just this, like their larger cellar cousins. There’s no excuse for keeping a selection of wine by your coffee table, bottles standing upright! Portable wine racks come in a variety of shapes, sizes, and styles. Many popular racks, made from wood or metal, range from small, space-saving modern displays that can fit on kitchen counters or end tables, to racks suitable for use in between (or even inside) kitchen cupboards. Most wooden racks can even be purchased or stained to match your cabinets, or a given room’s furniture, and many metal racks come in sleek black or chrome to match today’s modern kitchens. For a taller racking option, the VintageView Freestanding Displays assemble in minutes and offer visibility and modern presentation. Unlike other racks, your guests can easily see the labels on each bottle of wine, making this rack ideal for wine tasting parties (and for showing off your best vintages!) Because it’s freestanding, it’s also a good rack to have in the kitchen to minimize unused space, like between your fridge and a countertop. VintageView also manufactures wall mounted metal wine racks. Made from cold rolled steel and available in black or nickel finishes, these racks hold between 9 and 18 bottles per section, depending on design. Because they are mounted, affixing them to the sides of cupboards, walls, closet interiors, or near entryways are all options. These racks keep your bottles safely within reach, while being conversation pieces, too. Don’t see what you’re looking for here? Browse our wine racks or call 1-800-876-8789 to speak to a knowledgeable wine storage expert who can help you make the right selection. Why Wait on a Wine Cellar? With so many quality wine racking options, the ability to build your own wine cellar using custom racking kits has never been easier. From unfinished, Rustic Pine Wine Racks and Traditional Redwood Wine Racks, to stylish and contemporary VintageView Wine Racks that allow you to see your bottles’ labels clearly when stored, you’re bound to find a wine racking kit perfect for your cellar’s shape and personality. Even if you only construct one part of your cellar at a time, adding to it in bits and pieces in subsequent months, you can easily order additional kits of your selected design, enabling you to upgrade your cellar without fear of incompatibility. With the surplus of affordable, quality, easy-to-assemble wine racks and wine rack kits available, it’s easy to begin constructing your own wine cellar, today! In addition to its visual allure, a good wine cellar will help preserve your precious bottles, keeping them out of harm’s way (sunlight, accidental knock-overs, dry air, etc.) If you’ve invested a bit in your wine collection, investing just a little more in proper protection and preservation is a smart idea that will look good, too! Have you built your own cellar using any of these products? Have any of our posts inspired you to do so? If the answer is “yes”, we’d love to hear from you and, possibly, showcase your project on our site! (Simply send us an e-mail or drop a comment here.) Happy racking! Want to learn more about building your own wine cellar? Check out the how-to-build article or contact us for more assistance. If you’re looking to add some wine racks to your wine storage area, you might find yourself confused. What with all the different styles, sizes, materials, and colors available, picking just the right racks for your home and your collection can be difficult. To fit your style and your space, you might be tempted to go for custom wine racks. And while you might find that custom wine racks are the ideal option, you might also find that what’s not ideal about them is the price tag. If you’d like the custom look without the custom price, check out Designer Wine Racks. Designer wine racks are pre-made, but the individual racks can be fitted together any way you like for that unique, custom look. Designer wine racks come in a huge variety of styles: they have everything from display shelves to waterfall racks, as well as my personal favorite, diamond racks. 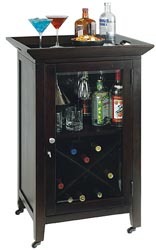 Each Designer wine rack unit is available in poplar, red oak, and premium redwood, all long-lasting and hardy materials. And each type of wood can be treated with a variety of finishes to ensure that your storage units match your decor. The Vintage Cellars build team can design a custom wine storage solution based around wine rack kits like Designer series racks, too. Check out our custom wine cellars page for more information and inspiration. Designer wine racks are a beautiful, elegant choice for the wine enthusiast looking for a smart storage solution. If you’re considering building a wine storage area, they are a great choice. But remember one important fact: most wine lovers find that once they have a storage area, their wine collections grow larger than they anticipated. Plan for more than you think you need! Apartment Therapy, the trendy website for design, technology, cooking, and other fun stuff, has just released its list of the best wine racks of the year. One favorite? VintageView wine racks. Good choice, Apartment Therapy–they’re one of our favorites too! VintageView wine racks use a unique design that allows you to store bottles label-forward rather than cork-forward, so that you can find out what’s in the bottle without disturbing the contents. Ingenious! VintageView racks are meant to be customized. You can purchase a single rack perfect for the corner of your studio apartment, or you can choose to outfit your entire wine cellar with floor-to-ceiling racks. Racks come in single, double, or even triple-deep sizes, and magnum-sized racks are available too. Whew! With so many choices, it’s not wonder that VintageView racks are a designer’s dream. Do you have VintageView wine racks in your home or business? As we’ve previously discussed here on the blog, green is in! More than ever, people are looking for environmentally friendly alternatives to the products they use in their daily lives. Using sustainable wood products is an important part of this effort. The forests of our planet are our oxygen factories, and we can’t live without them. Dwindling forests make for poor air quality, leave land open to being washed away by rainfall, and reduce the habitats of animals and humans. Not using wood is an option, and if you want to go that route with your wine racks we have great metal wine racks available, including sideways racks that will display your wine labels. But many people strongly prefer the traditional look of wood, and for some applications there’s no good substitute. So what is the environmentally conscious person to do? In recent years, several non-profit agencies have formed to certify the sustainability of wood suppliers. Their goal is to ensure that forests will continue to supply our needs for wood products, oxygen, animal habitats, etc for the present and future. Various agencies have different standards for certification, but they all share the goal of keeping our natural resources sustainably available. You can make a statement to forestry companies and make a commitment to the environment by purchasing wood products that come from sustainable-certified forests. Here at Vintage Cellars, most of our wood wine racks are made from materials that are certified by either SFI or FSC, two major agencies that certify forests as sustainable. Click here for a comparison of these two agencies (PDF). Most of our Vintner wine racks, Designer wine racks and Redwood wine racks as well as our commercial wine racks are made from wood that is certified by one of these agencies. More information on sustainable forestry is available on SFI’s site or you can get the Wikipedia overview here. The wine and wine storage industries are not immune to tough economic times. I read a statistic not long ago that showed the consumption of wine is up (by volume) while revenue is down roughly 25%. Basically that means we are all drinking more wine–that’s a plus. The bad news for the wine industry: the market has moved to less expensive, lower quality wines. The even worse news for the wine storage industry: those wines are consumed and not moved to long term storage. People still needs wine racks to store their wine. The average wine collector still wants a quality place to store their wine. But in many cases, the luxury of a custom cellar is no longer attainable. How can you get a custom-looking wine cellar at a kit price? The answer: Vintner Wine Racking Kits. The kit side of the wine storage has always been plagued by the lack of adaptability. If a kit is 72 inches high, it’s 72 inches high. There is no real design, spirit or imagination that accompanies a kit design. Vintner Wine Racking Kits have solved that problem. They come in 4 foot and 3 foot high sections to adapt to different ceiling heights. An individual or designer (like myself) can add some wine racking imagination with stackable kits. There are also different base heights, molding options and a center trim molding to create a custom wine cellar feel. Recently, to help Vintage Cellars customers fit into a specific budget, I have designed a specific wine cellar using Vintner Kits. I’ve been impressed with the results. If your budget does not allow a complete high quality custom design, semi-custom wine racking kits are your next best option. It’s flexible, design-friendly and high quality. Sound like the solution for you? Call me and let’s discuss your new almost-custom wine cellar design. Vintage Cellars is proud to announce two new ways to move toward sustainability in the building industry. Yes, we have taken wine racking and gone “green”. As you know, over the past 20 years Vintage Cellars has been the Southern California leader in high end custom hand made wine racking. Our quality and reputation are unmatched in the industry. Now, it’s our turn to lead the wine storage industry into the future. Recently, Vintage Cellars was presented with a unique opportunity. In a complete home tear down and rebuild project in Beverly Hills, we took the existing cedar siding on the old home and hand milled new wine racks. Not a step was skipped in the process. We worked with the client to design their dream wine cellar, used an existing portion of the old home and built beautiful custom hand made wine racks. 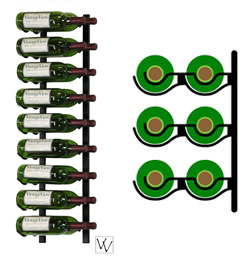 We have the ability in the marketplace to produce a 100% recycled wine rack. 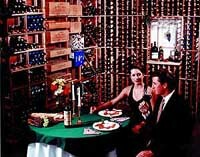 If you read the previous wine blog, you know Vintage Cellar also designs and builds wine cellars with unique wine racks known as the Vintique Collection. Vintique wine racks are made from recycled wine barrels and fermentation tanks from the Napa Valley. The wine barrels and tanks are dismantled and re-engineered into recycled wine racks, individual wine bottle storage, diamond bins, case storage, glass racks, archways and anything you can imagine. As you can see, Vintage Cellars is leading wine cellars towards sustainability and green building. For more information or to learn more about the release of these environmentally friendly recycled wine racks, please contact us.